I pushed myself out of my comfort zone to make the most impact on my personal and professional life. It’s been a truly transformative experience and has had tremendous applications in my consulting career. 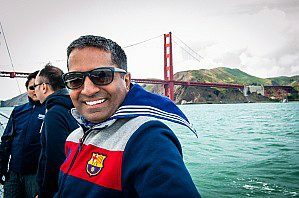 When Raj Bharti (@Raj_Bharti), managing principal of Collaborate Consulting in Seattle, WA, was researching executive MBA programs, he was particularly interested in gaining international exposure and broadening his global perspective. At Wharton San Francisco, he found that the ability to customize his education allowed him to participate in multiple global classes and activities across both coasts. During my time at Wharton, I participated in two Global Modular Courses, which we call GMCs. These are mini-courses — usually a week long — that do a deep dive into a specific business topic in another part of the world. They are a good example of how Wharton students can tailor their education by picking courses based on their interests in a specific subject or a geographic region. Several GMCs are offered each term so there are a lot of choices. An added bonus of the GMCs is that they expand your professional network. On my GMCs, I met students from the host countries, Wharton EMBA students from Philadelphia, full-time MBA students, and even a few undergraduate students. They were always diverse, international groups and we learned a lot from one another. My first GMC was on “Marketing in Emerging Economies: Understanding and Marketing to the Chinese Consumer” in Beijing. Previously, I served as a regional lead in the Middle-East for one of Microsoft’s marketing programs and had travelled extensively in that role; however, I had not spent much time in Asia and was longing to fill that knowledge gap. During the GMC, it was thought-provoking to learn how consumers, products, pricing, and positioning differ in China, and how population growth and fresh investments are affecting the marketing strategy. While I was in Beijing, I also took the opportunity to travel to Shanghai, Hong Kong, and Xi’an. My next Asian adventure was the Japan GMC, where the focus was on “Global Supply Chain Management.” The class visited Tokyo, Osaka, Kyoto, and Kobe over the course of seven very full days. We did company visits at places, such as Nissan, Panasonic, Aeon, Daikin, and Mitsubishi Heavy Industries, where we witnessed how quality and safety are engrained in the business ethos like nowhere else. We also spent time focusing on deep cultural characteristics, especially in the traditional city of Kyoto. I was astonished to see how accomplished yet humble Japanese people are; we observed senior executives bowing to us until our bus departed after company visits. That’s something you won’t see in North America or Europe. This was my favorite GMC from a learning perspective because we were able to pack so much into a single week. 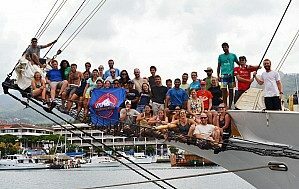 I’ve had never sailed in my life so when I learned that Wharton offered a 10-day Leadership Venture called Tall Ship Sailing in Tahiti, I knew I had to check it out. 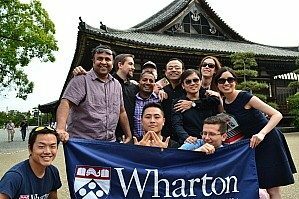 Wharton Leadership Ventures are noncredit courses run all around the world through the Wharton Leadership Program. We had to figure out how to delegate tasks, chart the course, motivate everyone on the team, and keep the ship running in a resource-constrained environment. It was an unbelievable experience in which I learned a great deal about leadership under pressure and also made 23 new lifelong friends from the Wharton’s full-time MBA program. While there are plenty of optional global classes and programs, the International Trip is the only one required for all students in the EMBA program. It occurs at the beginning of the second year when students on both coasts spend a week in another country to learn about business issues in that region. We were given a choice of several countries, including Spain, South Africa and Indonesia. I chose Spain because of its themes of tourism, gastronomy, and sports. It was an eye opening trip across beautiful cities of Barcelona and Madrid and a great opportunity to meet my classmates from the East coast and deepen relationships with my West coast classmates. I was born in the land of Gandhi and later spent half of my life in the land of Lincoln. I have been always intrigued by the fact how a single person can change the face of a nation, so my next venture is taking me to the land of Lee, the late founding prime minister of Singapore. Soon after graduation, I’m planning to go on my last GMC to Singapore, Malaysia, and Indonesia where the theme will be sustainable growth. These three post-colonial nations currently stand at a per capita GDP of $55K, $10K, and $4K respectively despite having similar starts. I’m looking forward to learning more about how countries with similar humble beginnings, but entirely different economic strategies, can have surprisingly different outcomes. Most students wouldn’t think of Philadelphia as a way to gain international exposure, but spending time on that campus certainly helped me achieve my goal of gaining more perspectives. My first visit occurred early in our first year when the entire San Francisco class spent a class week on the Philadelphia campus. During that visit, I also did a one-day trip with 50 classmates to the Gettysburg Battlefield with Prof. Michael Useem. We learned how minuscule leadership mistakes can have monumental consequences. Later in my second year, I returned to the Philadelphia campus for an entire semester. This may not be feasible for many EMBA students because of work schedules or other commitments, but I run my own consulting business and was able to take time off from my client engagements. I attended classes with our East Coast EMBA cohort. (My schedule allowed me to attend a few full-time MBA classes too.) I did this to expand my network and gain more viewpoints, but also because it was a cool opportunity to experience life as a student on an Ivy-League campus. Being in Philadelphia also enabled me to spend more time with my “sailor” friends from Tall Ships Leadership Venture and participate in activities like the Wharton Business Radio show on SiriusXM. I tried to make the most of my time at Wharton by doing as many of these immersive activities as possible. Once I got in and paid the tuition, I knew that time would be my only constraint so I made a point to organize my life up front, allowing me to have more flexibility in my schedule. I also thought carefully about the knowledge gaps I wanted to fill and the types of endeavors I wanted to engage in. Finally, I pushed myself out of my comfort zone to make the most impact on my personal and professional life. It’s been a truly transformative experience and has had tremendous applications in my consulting career. To read more about Raj’s experience during the Global Modular Course in Japan, click here.